I bought a cheap VFD off Amazon for $100 rated for 2hp that worked perfectly powering a 1.5hp feed motor on my planer. Would this one work? It is 220-240v input and 220-240v output, 1.5kw 2HP. It is single phase input to a 3 phase output. The price on it is $109. Seems simple enough. You could actually get away with using a 120v single phase input VFD to get your 240v three phase output… if you are short on 240v outlets. And you do not need one twice the size of the motor. Just check the rated output current with what your motor says it needs. Any 1hp VFD should work fine, although I tend to shy away from the cheap e-bay deals for several different reasons. YMMV. The motor plate on the feeder says 440v so would I need to find a 440v VFD? Would the one in the above photo work? Do you have access to the motor within the feeder to see if it’s capable of dual voltage input? 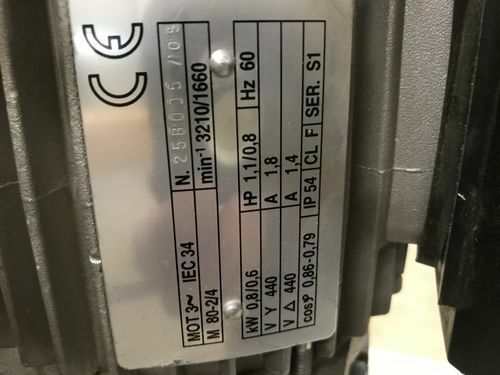 It’s very unlikely to find a motor that will only accept 440V. It would be understandable if the company making the feeder only listed one voltage as having additional hands of unknown skill rewiring their product outside of the factory could reduce reliability. It s very unlikely to find a motor that will only accept 440V. I have never seen a dual voltage feeder. Doesn’t mean they don’t exist but none of the Comatics or Steffs I have owned could be switched over. Do you have access to the motor within the feeder to see if it s capable of dual voltage input? It s very unlikely to find a motor that will only accept 440V. It would be understandable if the company making the feeder only listed one voltage as having additional hands of unknown skill rewiring their product outside of the factory could reduce reliability. According to the motor plate, it appears to be 440v only. 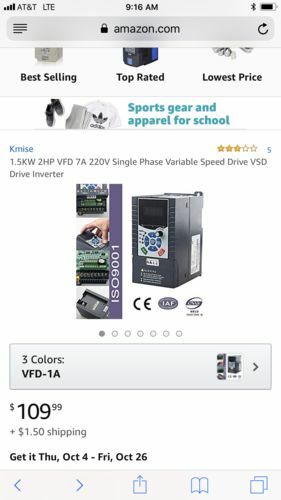 Assuming that to be the case, what would I need to run it on single phase power? Besides a phase converter? I know that I either need a transformer (of which I don’t know what brand, model or specs to look for) or my other option is to take the feeder to my local electric motor shop and have them rewind the motor to opporate at 220v. I am also open to the idea of buying a Rotery Phase Converter if it would allow me to to run multiple machines (not at the same time) without having to buy expensive custom made VFD’s. Right now I have four machines that I was intending on buying custom VFD’s for. They are; 1. My wide belt sander with a 10HP main motor. 2. A smaller 1 to 2HP VFD for the feed motor on my wide belt sander. 3. My Powermatic model 72 table saw that has a 7.5HP three phase motor. And then this Maggi Steff 2044 power feeder which has a 1.187HP motor. So that is already four VFD’s that would cost me over $2,000 just for the above four machines. If anyone could suggest a good RPC make and model that would work for these machines, that would be sweet! Otherwise, any help that you guys could provide on getting my power feeder going would be great. I need it first and can worry about my wide belt sander and Powermatic 72 later. Thanks. Look in the picture of the motor plate posted above. It appears to clearly say 440v twice, with no other voltage numbers listed as far as I can tell. Would you mind looking at the post above this one with the pic and give me your opinion? If it is 440v, what kind of transformer would I need? Can anyone post a link to a specific transformer? Once I get the transformer all that I would need then would either be a VFD or an RPC, right? Also, could I get the motor rewind for a lower voltage and take away the need for the transformer? I would be surprised if it is a dual winding motor. I also don’t think having it rewound would be even close to cost effective since those tall narrow motors are expensive to rewind and a lot of motor shops won’t even do them. I have never personally dealt with boost or buck transformers. On the RPC front something like the American Rotary AR-20 would run what you have. A 10hp starting RPC (off the shelf not pieced together) along with your 3ph load center, breakers and wiring will have you at about $2k, assuming you do the wiring yourself. I did some research and Maggi offers a 220V & 440V motor, both in 3ph as well as a 220V single phase motor in their parts diagram. I too would guess, based on the information now available, that it is not going to be cost effective to rewind it. Conversely, a motor is > $500 for a single or three phase replacement.